Malachite is a stone that attracts spiritual powers into our physical reality. This is a stone of transformation and change. It clears the space from negative energies and negative radiation of any kind. Malachite teaches us to assume responsibility for our actions and choices, for every our thought, feeling, word, or deed. It is a remarkable healing stone. Malachite has a noticeable color that is layered concentrically with brighter and darker areas of the same basic green hue. It is an opaque stone that can be polished to a high luster. Notable occurrences are in the USA, Congo, Angola, Zambia, Namibia, Mexico, England, Australia, and Israel. Malachite is a carbonate mineral, more precisely, a hydrated copper carbonate. It crystallizes in the monoclinic crystal system. Individual Malachite crystals are rare, but, occasionally, they are found in form of thin, prismatic crystals. Malachite occurs together with Azurite, Goethite, and Calcite as a products of weathering of copper ore deposits. Apart from the different colors, the properties of Malachite and Azurite are very similar. However, Malachite is more widespread than Azurite. Typically, it is associated with Limestone, which is the main source of carbonates. The name Malachite is derived from the Greek word, molochitis, meaning “mallow green”, which refers to the similarity with the leaves of the mallow plant. Since ancient times and up to the 18th century, Malachite has been used as a pigment for producing green paint. Malachite absorbs radiation and protects against all sorts of radiation and electromagnetic smog. As far as Modern and Traditional charts are concerned, malachite is not a birthstone. However, there are ways to associate this stone with some zodiac signs. One obvious ways is to use the natural chart by virtue of the color (Green in this case). As a beautiful moss green color, Malachite is suitable for people born between April 19th and May 20th. This means Malachite is a Taurus birthstone and it will bring this sign a lot of success, increased energy and physical healing. Additionally, Malachite can be successfully used by people born under Cancer and Scorpio. This stone brings a continuous, pulsating energy. 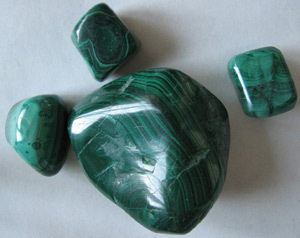 Malachite is also a stone of transformation that helps in times of change. It stimulates us to take full responsibility for our own actions. It instills understanding and intuitive solutions for the life problems, even before we are obliged to take actions. Malachite is a powerful stone that may store information of special spiritual significance as well as practical knowledge that leads to accelerated evolution. People of every spiritual path may use it in their daily practices. When placed on the third chakra, Malachite facilitates deep emotional healing. It helps identify, reorganize, and release the suppressed negative experiences and unconscious blocks. All those who have been overcome with accumulated feelings of guilt may also find it very useful. How to heal that which we have no conscious knowledge or memory of? Malachite can be of great assistance here, as it helps in cleansing the past events that we have no full recollection, but that, nevertheless, influence us and represent a huge burden on our shoulders. If you often feel guilty without knowing where exactly that feeling originates from, Malachite is a good stone to have in your collection. It will bring insights into the causes of your hardships, distress, and anxiety. Malachite is considered a protective amulet when traveling by air; it prevents dizziness and stimulates the right frame of mind. Malachite helps in the correct understanding of love. It represents the faithfulness and loyalty in love relations or friendships. It can be combined with Jade, which can also serve as a stone of faithfulness in all human relationships. Malachite mounted on gold increases its strength. Malachite does not irradiate, it only absorbs energy from its environment. Because of that, Malachite is suitable to draw the negative energy and tension out of the body, which it best performs when placed on the solar plexus chakra, where a lot of emotions tend to accumulate. If used for taking the negativities vibrations out of the body, it is necessary to cleanse it thoroughly immediately after every healing session. 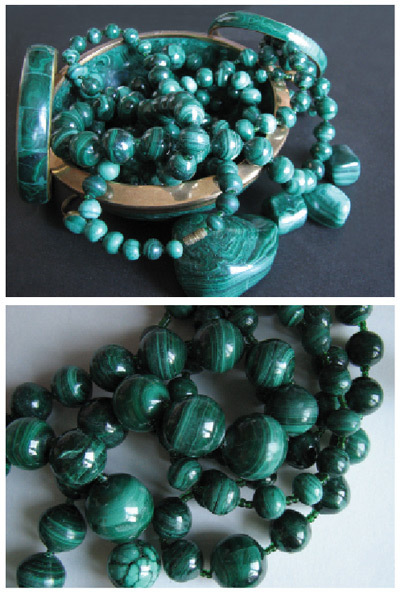 If you want to stimulate your creative expression, Malachite can be a very useful stone. In that case, put it near the throat chakra and contemplate on the immense, limitless creative potentials of Nature. 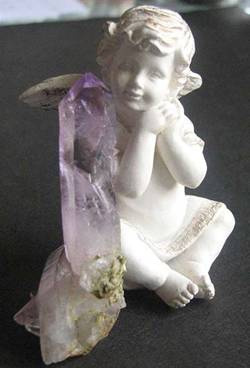 When placed on the third eye chakra, this stone stimulates the concentration and clear vision. In crystal healing, Malachite can be successfully combined with Azurite and Chrysocolla. With its powerful cleansing of the entire auric field, it can pull pain and inflammation out of the organism, and protects the well-being of the body. This is a highly responsive stone, whose effects kick in very quickly after laying it down on the affected area of the body. When placed over the heart or solar plexus chakra, Malachite helps the proper functioning of the stomach, liver, kidneys, lungs, and immune system. It cleanses the soul as well as the body. Malachite is also good against asthma, arthritis, rheumatism, pain in the spine, muscle spasms, and swollen joints. It helps heal broken bones and broken muscles. It also helps the respiratory organs, regulates blood pressure, improves the metabolism, and regulates the body weight. By releasing the old traumas and recovering the repressed memories, Malachite restores the ability to breathe deeply and evenly. For maximum efficiency, always use polished Malachite stones. 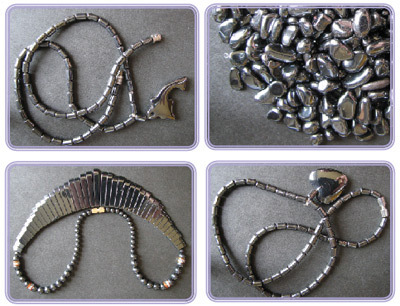 If the stones feel heavy and cloudy because of the intensity of the absorbed negative energy, they should be purified without delay in a bowl of tumbled Hematite stones. Using water or soap on Malachite is not recommended, nor should you use excessive heat. Do not expose it to too much sunlight. It can be charged in the presence of charged Rock crystals. Malachite elixir should never be prepared. One should avoid accidentally inhaling or taking in of Malachite powder, as it is also harmful.